Winter can be a time of huge power bills, wet clothes and a barren garden. Here's what's been going on in our house to minimise these problems. Garden, i.e. what are we going to eat all winter? 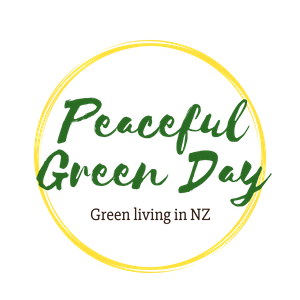 We are so lucky in New Zealand to be able to grow our vegetables year-round, and it's perfectly possible to provide all a family's green vegetables from a standard back yard garden. It doesn't take consistent hard work, just short bursts of it - and good timing. Here we are on the last day of March, and my brassica plants are pathetic. I wish I'd taken my own advice. Last year in a burst of pride at my accomplishment I wrote a post on How to create a garden that feeds you all winter. Key to this is starting early (as in February, ideally) with sowing seeds. The February heat usually brings a swarm of white butterflies with their brassica-devouring caterpillars, so seedlings must be covered or be destroyed. Ignoring my own advice, this year I let my first lot of seedlings be destroyed. Cut up milk bottles make seed labels and containers. dislodged by a stream of water from above. I then got organised and got my seed raising shelves into action. 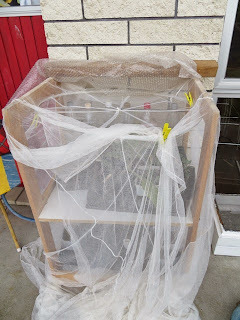 That's an old mosquito net protecting it, and a net curtain works well too (think garage sales, church fairs, op shops to source one). As I write on the last day of March, grabbing seedlings of your favourite brassica from a shop or market is the best bet for New Zealand gardeners - any seeds sown from now on are unlikely to reach your dinner plate until spring. The plants need time to grow to a decent size before cold weather and frosts slow them down. I'm having trouble pulling out our summer crops to make room. We are still flooded with cucumbers, zucchinis and beans, not to mention grapes and feijoas. Sowing a crop of Yates Freezer Slims bean seeds in late January was a smart move. They are in full flush right now, and have turned out to be Very Good Tucker (according to us AND the snails; fortunately the snails mainly like the leaves) - more than adequate payback for pushing a few beans in the ground and keeping them moist for a few days! beneficial insects in spring. It just keeps flowering. The tomatoes are blighted now, however, and we're getting just a few to keep us going. They'll come out in the next few days, making room for more brasssica seedlings with a shot of compost. One of my favourite brassicas is Cavolo Nero kale. I love its flavour stir-fried with oil and garlic, and the way its leaves aren't too crinkly, because the crinkles attract snails. A farmer's market is a good place to find the seedlings, because the supermarkets don't seem to be on to this superfood veg yet. There are plenty more greens-producing tips in the How to create a garden that feeds you all winter post. I recommend it for your bank balance and good health. Speaking of which, here is the basis of my winter anti-virus soups. That is, the old-fashioned type of anti-virus. I so enjoyed the butternuts that I bought from the Hamilton Farmer's Market this winter that I kept some seeds. I sowed one next to a compost bin and let it sprawl over the lawn and fence (it was meant to only be on the fence, but it is a free spirit and I was too soft on it). I have five large compost-fed butternuts to look forward to. One is growing on the neighbour's driveway, but they appreciate the importance of these things, being vege/fruit growers and chicken-keepers themselves. Firewood, firewood, firewood. We always keep an eye out for people felling trees, and piles of unloved wood. We have about three years' worth stashed about our property now, all for free (apart from the trailer hire and some petrol or electricity to fuel the chainsaws for the big cuts). Sometimes I do the finding, but mainly my husband does the grunt work - and it is a lot of physical work. This warmth not only heats our house, but finishes off the clothes drying. We also heat water for hot water bottles and do a bit of cooking on the top of the woodburner. I love the clothes lines under our carport to keep our washing out of the rain! It faces west, where the prevailing wind and afternoon sun comes from. In winter I often just hang big things there (towels, sheets, etc.) and put the other things on our clothes drying rack. It can sit outside during the day and be brought inside at night. After spending a night in the room with the woodburner, everything is beautifully dry. Do you have any prep-for-winter tips?